Very robust and strong sewing machine for mounting of lines on fishingnet. The sewing machine can handle mounting of both new and second hand lines up to Ø 10 mm. The machine is very reliable and ensures a regular sewing at both low and high speed. The Brother sewing machine can be delivered with normal table or table in aluminium, and netholder in aluminium. This sewing machine is a modern, electronic sewing machine, especially suitable for mounting of fishingnets. The Brother B-430 can handle mounting of both new and second hand lines up to Ø 22 mm. Rasant sewing thread for mounting of fishing nets is a highly developed sewing thread. It has a polyester core with cotton covering. The thread is treated and twined thus preventing a twisting effect. Rasant sewing thread no. 35 is strong, safe and suitable for exposed sewings such as on fishing nets. 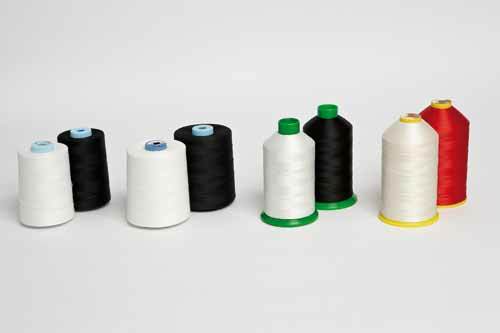 It is available in the colours black and white on spools of 3.000 m.
Permacore sewing thread is also very suitable for mounting of fishing nets, being a thread that can be used succesfully on exposed sewings. Permacore no. 35 has a polyester core with polyester covering. It provides a strong, wear resistant sewing. The sewing thread comes in spools of 5000 m, in colours black and white. Other equipment we have in our assortment for sewing machines and mounting nets are loopers, sewing needles from Schmetz, scissors and marking tape in many colours.